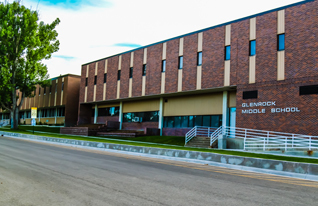 Welcome to the Glenrock Intermediate School! GIS serves our district’s fifth through eighth grade students. Check our school pages for links to important educational resources and documents, information about our activities, and the latest school news. At our small and close-knit school, we’re very proud of our students and their accomplishments. Our dedicated staff members work hard everyday to bring the best learning opportunities possible to our student body. We are family at GIS, and we welcome parental involvement in the classroom and at school events. Our door is always open to you. Please stop by if you ever have any questions.